Organizational approach for maximizing 'bang for buck' for inclusion of several types of artistic content versus the labor required to implement it. Allowing for the inclusion of more content, with less labor through organization and approach. 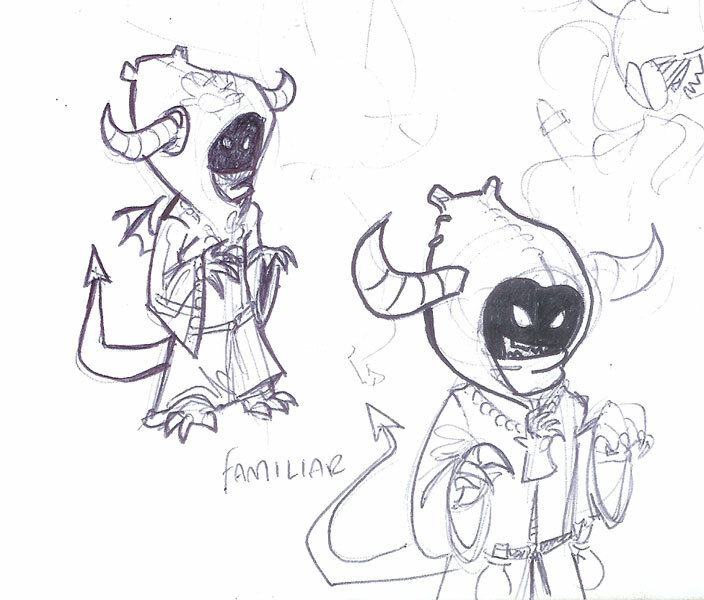 More creature types with less animation workload and the possibility of Burning Pet's idea of a 'hybridizing creatures' by use of combination idea being implemented, as well as an easier implication of 'helmets'. 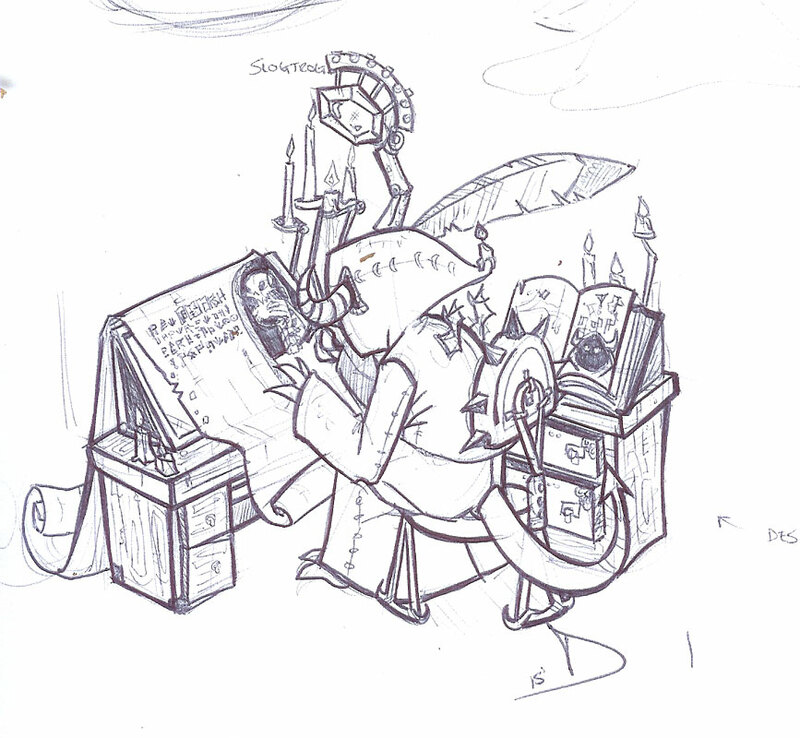 This concept, or approach to creature implementation was birthed to combat and supplement the lofty workload requirements that would be created by the Hybrid making system put forth by Burning Pet's idea for the allowing of combining creatures to make unique ones. I believe his suggestions were 'combining an orc and bat to make a flying orc' and something else. My first reaction to that, when I read it was as follows: "Jesus H Christ!... That's F*****ing insane!". Those were my exact words, said out load, in front of the keyboard. Now I didn't make that statement in terms of thinking how cool of a concept it was. Though, admittedly, I did and do find the idea intriguing. Mostly because I can't think of any other game of this nature that has allowed anything like it before. No, I didn't make it in glee, as must in reflexive sympathy for the sheer amount of work such an idea would entail. Now, lemme address that I have done animation work before in games, so I know of ridiculous animation work loads can get. And what most people do not realize is, is that the most damning thing about putting animation in games is that it that the workload does not come in implements of addition, but rather multiplication. What I mean by that is, every new animation is not + 1 animation, it's the adding of a 'times 1' for every creature or unit in the game that requires it. Here's a quick run down of what I mean by this for those of use who haven't experienced the pain of animation for games. Let's say every creature requires 3 animations. Attack, Walk, And Eat. Now you have 3 creatures. So now those 3 creatures all need those animations. That's 3 x 3, so 9 animations. Now, we want to add a sleep animation, that's 4 animations, 3 x 4, that's 12. Now, let's say we want to add 30 creatures, that's 120 animations. Now let's say we no longer have 4 animations, but 10, that's 30 x 10 that's 300 animations. It becomes an instance where adding even one creature or one animation to the game becomes more and more a damning and work intensive process. The first addition in that work load, was only 1. but by the end, it was 292.. And still likely growing, given the imp animation list is around 100 + at the moment, I think some means of reducing this workload is prudent. Now, I suppose that we are all on the same page, I'll cover a quick overview of this idea, and move on to how I think such work reductions could be implemented. This idea comes in 3 parts. ♦ 1: Animation Reduction: The reuse of Skeletons to reduce animation workload. ♦ 2: Animated Props: (for combining creatures) The Construction of animated prop models. ♦ 3: Blend Shape Helmets: The implementation of using Blend shapes on helmets to fit various models to save on modeling/unwrapping/texturing work load. In this first section, we'll cover the building of new creatures around already implemented creature models. I should note 3 things. 1, this is not cheating. Anyone who thinks conserving artistic labor through clever reuse of assets is cheating has never had to fathom the work behind multiplying animation list versus unit amount. 2, this is not a means to completely do away with the lofty animation work load as it is to reduce it. Not every creature in the game will be eligible for having an old skeleton bound to it. More variety of skeletons will still be required before this game is completed. However, this will not only add value to the work of your older skeletons, but any new skeletons and animations created fresh as well. Knowing that, later on, the skeleton you are making for new creature A, could be used for new creatures B and C later on down the line. and 3, while not required, adding 'some' new animations to older skeletons to break the obviousness of the reuse of said skeleton for new creatures might be advisable. A few things as simple as giving a new idle, walk, and attack animation to a new creature with the same skeleton as an old one can make it so most people will not even be able to tell the skeleton is being reused. This would increase workload slightly, But be noting in comparison to the normal work load needed to construct a new creature from scratch. New animations can also be added at the leisure of the animator versus being required 'here and now' as well the older animations may not suit the creature being constructed, will still 'fit the bill', allowing the creature being constructed to be included in game immediately. Most importantly, it turns animation work loads from multiples to additions. +3, +4, or even + 10 new animations to include a new creature is nothing compared to Times 'X'. Especially further down the line. Now, to further articulate how this might work. I think a few examples might be best to show this concept in action. Yes, I will be using my new favorite example creature. The Necrolite. Which, none of you have met yet. So, let's meet the little fellow, shall we? It's fitting I use him for this, as he's sort of my go to creature to doodle whenever brainstorming anything magically related. 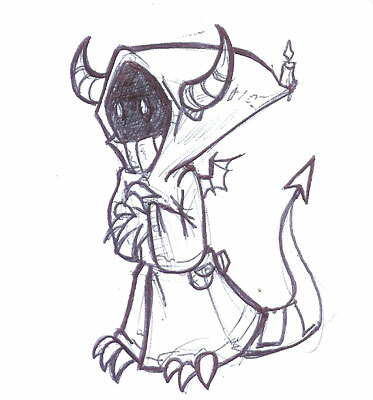 Originally he was to fill the role of the Dark Priest suggested by Palandus. But has sort of evolved in my mind as a sort of magical grunt worker, a weak unit good for magical related grunt work, but not for combat. I'll also show off the unit I've dubbed the 'Lichwraith' as well, which is similar in design, but taller and more intimidating looking. Mostly because that doodle just happened to be next to one of the Nercolite doodles. Mostly, the reason he is my go to for stuff like this, is, well, he's easy to draw and he feels like he fits nicely in the Dwelver's universe. 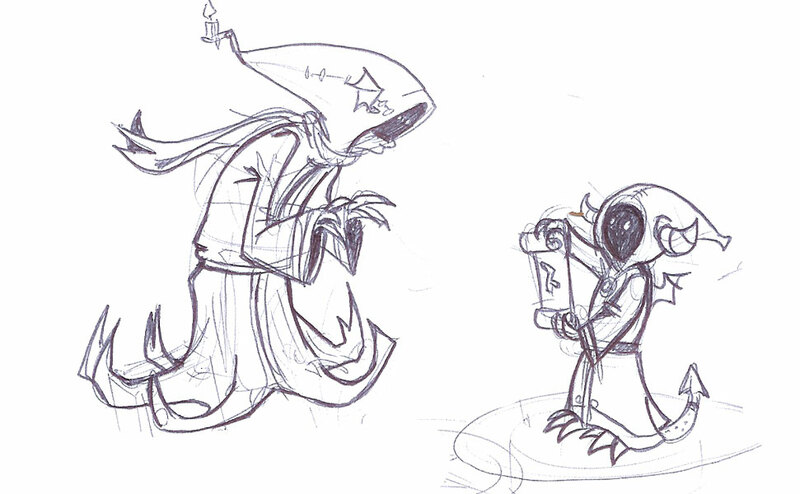 And generally, when I doodle things for magic stuff that isn't in the game, I want to doodle some creature to be interacting with it. So until some magical unit is implemented, the Necrolite answers the call! Such as he is answering here, showing off the Scribing Desk Idea. As you can see, it lines up relatively well. The fingers and feet might need to be shortened to fit the skeleton, and the 'bag' of the robe, particularly on the sleeves my be an issue. But for the most part, a good fit. If this were me doing it, I may even scale the Necrolite up, skeleton and all just a slight bit. Just to make to break the obvious retooling done. And speaking of breaking the obvious retooling, as mentioned before, a few unique animations could be added now to make the Necrolite feel like a more unique creature. Instead of the typical one hand out run animation the imp has, it could have it's hands outward, perhaps hunched over slightly. A different Idle animation similar to this might also be desirable. Put just enough work into including new animations to give the feel of it being made from scratch, while keeping more busy 'junk' animations, such as climbing ladders and perhaps even eating and drinking, the same. This will not only save work now, but in the future as well, for any new animations needed to be implemented later in the game will not only work for the imp, but for the necrolite as well, and vise-versa. The last benefit, of coarse, is that these animations can be done as the leisure of the animator. The necrolite would have a perfectly functional animation set already. And while I would highly recommend just a few unique animations to give a sense of individuality to any 'copy pasted' skeletons used. If no one ever got around to it, it wouldn't break the game. But now we move on to 2 others aspects of the Nercolite that do not fit the skeleton of the imp. And honestly, those two things could be cut from the model entirely. The Necrolite would still be a charming design even without them, I think. 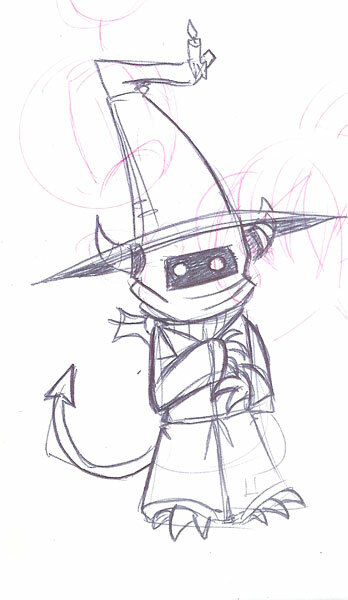 However, some creatures might benefit much more, or even linchpin on, added details such as this. So, it seems like a good way to demonstrate how Animated Props can be used to combat this problem. 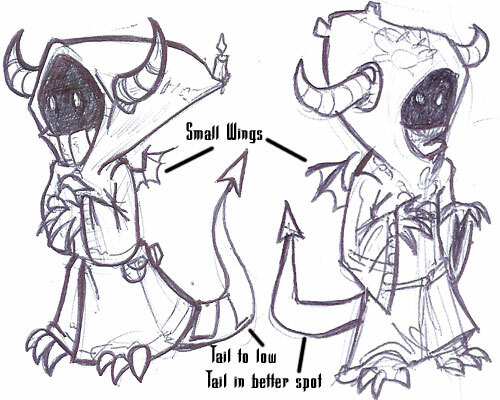 The idea of this will be to animate the tiny wings and tail separately, as props, and then parent them to the skeleton of the imp. Meaning that, in the future, any creature that requires these tiny wings, the blunt of the animation work will be done, and it will simply need to be bound to a bone or such and tweaked accordingly. I should note this is where things can get hairy. Animating things like this separately in this manner can be a chore in itself. There are a number of factors I'm not really privy to. So please, please, scrutinize and think about weather or not this is plausible for you and your team. However, I will note if this can be implemented, it will make the concept of combining creatures together much, much more plausible. Now, assuming this is a desirable direction, First, we will need to good a little planning. The Wings will be rooted to one of the back joints, and shouldn't be to hard. However, it's important to note it will be much harder to bind the tail to a positing the fits underneath the robe as it does in a lot of the designs. It will be much easier, and more reasonable, to parent it to the root pelvis bone, provided my estimation of where the skeleton fits is correct. Here it can be 'crashed' into the back of the pelvis, much as the wings will be 'crashed' into the back. Now, how these will be animated becomes subject to needs of whatever main animation the skeleton itself is preforming. Again, this is where things get a little hairy, and I might advise that, if you do attempt to implement these Animated Props, you do so on a creature such as this. Not necessarily this one, and not because it's my design, but because these items are not vital to the overall concept and execution of the creature in game. Which means if this system proves to be to unwieldy, it can be scrapped entirely without loosing any of the core work done on the creature itself. 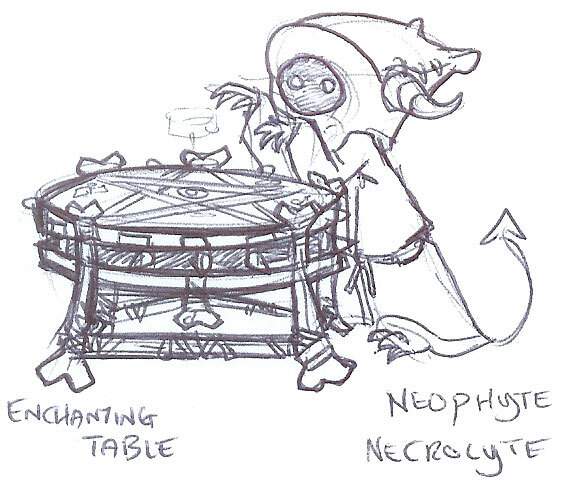 Even without a tail and wings, the nercolite would still be a ready to implement unit once bound and weighted to the Imp's skeleton. So use the concept on a creature like this. Test the waters a little. See if it is indeed something you can handle, or if it's something more trouble than it is worth. The last thing I want to cover is an idea to hopefully minimize the labor required for the inclusion of certain unique items displayed on creatures, most notable, there helmets. For those who do not know what blend shapes are. Blend shapes are a means of manipulated and morphing vertices, used most often for facial expressions. However, they have other uses besides this. They are the reason in 'create a character's in games you can adjust things like the fatness, or arm length, or cheeks of your character with ease. If one has every played Skyrim, one might not know that Blend shapes, or something very similar to blend shapes, called .Nif files are used to fit the model of armor to there characters form. While .tri files are used for the actual facial animation. Nifs Allow for the armor to adjust in size depending on your characters weight to reduce, or do away with unpleasant looking crashing. Now, let me note I don't think the Body armor system of Dwelvers should be retooled around this. As far as I'm concerned, a texture is all that is required for this. Good texturing is more than enough to convey different types of armor. And in the past, lower poly games were made or broken by the skill and execution behind there textures. No, this is mostly for the helmets, which will require a model to change to fit the various types of heads of creatures in the game. Giving each helmet a variety of properties to adjust and morph will allow for one modeled head piece to fit numerous creatures skulls. Not to mention allow for variety of creatures head types. This will minimize the amount of unique models that will need to be constructed for helmets. While some creatures might have various details that might require helmets to be modeled from scratch. The flip side to this is that it will still require some labor to 'fit' each morphed helmet to the corresponding skull. And I cannot not attest to how this might effect coding or optimization. Bare these things in mind when reviewing this concept. It is very true that letting all creatures do all tasks will result in an exponential grow in number of animations. What you said about having different creature types using the same skeleton is something I already have tried out, and I will get back to it soon enough. If you were with us from the start the Dark Dwarf we had that got replaced Orc, his skeleton and the orcs skeleton is actually the same. The same goes for the old imp model and the new imp model. So we will most definitely use this technique in the future to create more variations and lessen the workload. What you said about the helmets and vertex blending is nothing I am familiar with, but I will look it up! Yes, it's sort of a balancing act with the skeletons, but consider the whole 'few unique animations' thing. I think it will really workwonders for creating the illusion of you using more skeletons than what you are actually using. Though I can't really say which ones aside from things like 'run and idle', since I really have no idea exactly how many animations you have, or what sorts, kind of hard to keep track with some many critters on the screen. I also want to point out the whole Animated prop thing. If you can manage something like this, the Hybrid system will become doable. If you can't I simply don't think it can be, at least, not without a great deal more constraint. For example, if you did animate some 'large wings', you could attach them to the back of the orc and make the 'winged orc', having to only perhaps make a few 'in flight' poses (I imagine him sort of hunched over, maybe wagging a little back and forth in the air for an idle, hunched over leaning forward to move forward, maybe a landing and take flight animation, and an attack in air) to get such a creature concept done. Still kind of an undertaking, but nothing compared to doing a new skeleton from scratch, binding it to model, and animating everything over again. Plus, then you have wings for winged fishmen, or rogues, or what have you. However ya'll want to go with that. If you're still considering going with it. Is that idea still something ya'll are considering, btw? Because, I have a somewhat fleshed out system on how to make the whole thing work and be a little more practical in application. But It's kind of lengthy, and I'd rather not write it up if the idea has already proven to big to implement. Anyway, glad you enjoyed the read, hope it helps out. Current time: 23-04-2019, 08:10 PM Powered By MyBB, © 2002-2019 MyBB Group.